It's a black 2006 1.4l VW Polo hatch. I bought it brand new from Alpine Motors for R114000. It was my first VW. From the word go the car drove beautifully. It had great power for a 1400, handling was good and the styling of the car was great. 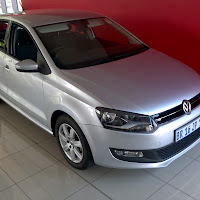 At R114k, it was a bargain! The thing that let me down though, was the car had a defect. It had a problem with the engine management unit that took Alpine motors 7 months to fix. 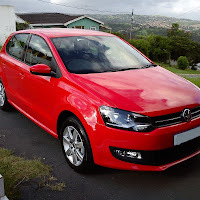 The car was in and out of the workshop for 7 months and VW didn't know what was wrong with the car. Only after I wrote to VW Germany did they get the car fixed. At the time the car was doing between 30000kms and 40000kms. I'm going to pay it off soon and it will be given my wife and then we'll begin the hunt for my next car.